The Associated Press recently released a chart from the Centers for Medicare and Medicaid Services’ Office of the Actuary that outlines spending for the top 20 costliest drugs to Medicare in 2015 after reaching Medicare’s catastrophic spending threshold: http://www.nytimes.com/aponline/2016/07/25/us/ap-us-medicare-pricey-drugs-glance.html. UPDATE: The AP also released another story, on July 24, 2016, outlining the overall program costs of catastrophic spending and explaining various spending increases: http://www.nytimes.com/aponline/2016/07/24/us/politics/ap-us-medicare-pricey-drugs.html. As the AP explains, catastrophic spending begins after an individual beneficiary meets a specific threshold ($4,850 for 2015). During catastrophic spending, “The beneficiary pays only 5 percent, while their insurer pays 15 percent, and taxpayers cover 80 percent.” The AP further noted that “Catastrophic spending is a large and growing share of total costs, threatening to make Medicare’s popular prescription plan financially unsustainable.” The CMS data shows the combined spending after catastrophic coverage, including beneficiary, insurer, and taxpayer contributions. Total spending for the top 20 Medicare drugs reached over $20 billion last year. Total combined spending on Harvoni and Sovaldi reached $7.5 billion, 37.4% of the total top 20 spend. Medicare spent between 4.4 and 16.3 times more on Harvoni and Sovaldi combined compared to each other drug in the top 20. Spending for Xtandi increased from $447 million in 2014 to $633 million in 2015, an increase of 41.6%. Drugs with a primary indication for cancer accounted for 5 of the top 20 drugs and $4.4 billion in spending (22.1% of total spending in the top 20). 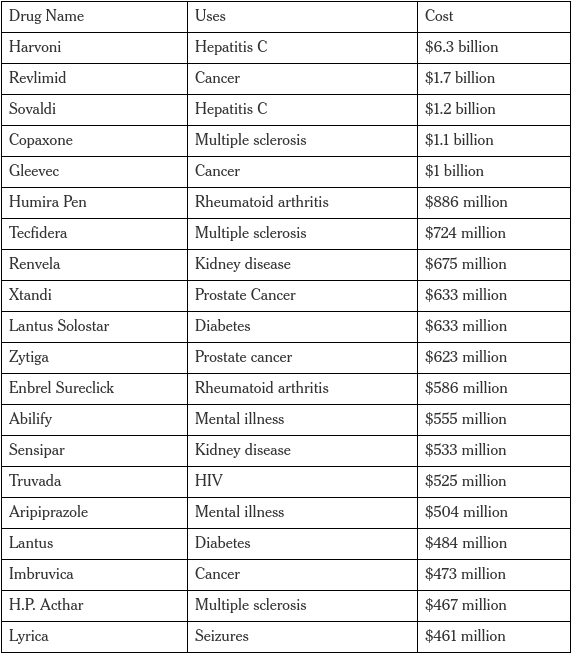 Patients paid an estimated $1 billion in coinsurance for the top 20 drugs, on top of insurance premiums and other health care costs.